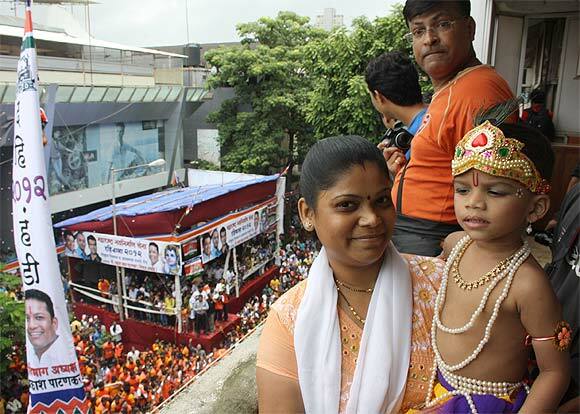 Amid chants of "Govinda ala re", thousands of Mumbaikars on Friday celebrated 'dahi handi' festival on the occasion of Janmashtami, the birth anniversary of Lord Krishna. As is the trend, this year's festivities were also marked by rising cash prizes and presence of Bollywood personalities, lending a glamour quotient to the annual event. 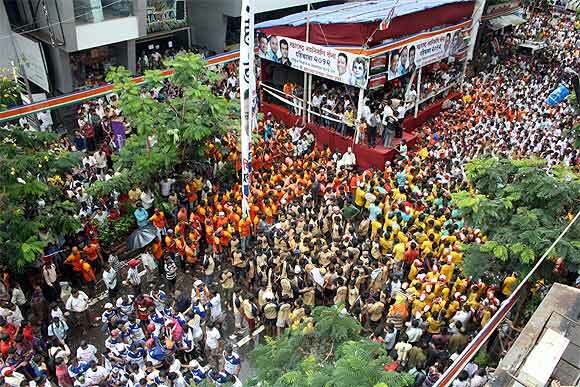 Piling onto their cavalcade of trucks and motorcycles, hundreds of 'Govindas (young men)' were spotted travelling to pandals to prove their mettle by breaking pots of curd hung high in bylanes of the metropolis. 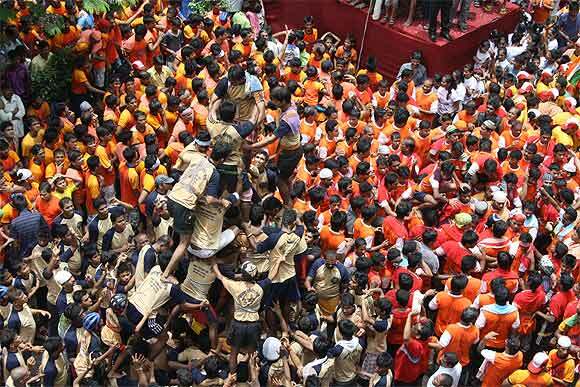 'Govindas' formed human pyramids and stood on top of one another, attempting to break clay pots filled with butter or curd tied to ropes even as their efforts were thwarted by water splashed on them by those gathered around. 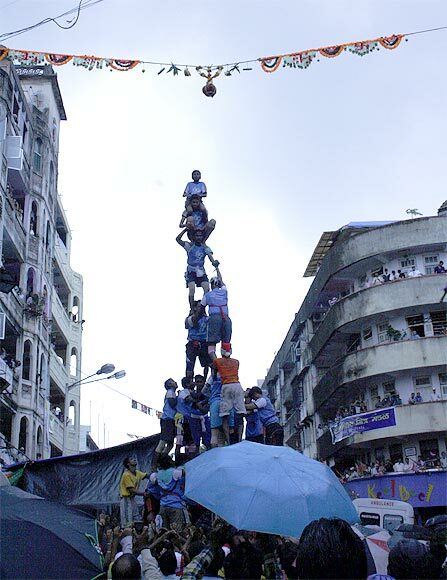 Hundreds of 'Govinda mandals (groups)' participated in the festival at various places in the metropolis where human pyramids were formed to reach the pots containing dahi and win cash prizes. The festival is inspired by the mythological tale of Lord Krishna's boy-hood trick of stealing butter from a suspended earthen pot. 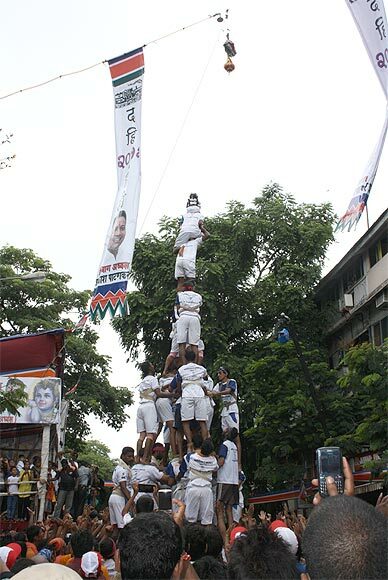 Almost all big 'dahi handi' events are sponsored by political leaders. Nationalist Congress Party MLA Jitendra Ahwad, organiser of Sangarsh dahi handi in adjoining Thane, invited 'Jism 2' star Sunny Leone for the event. 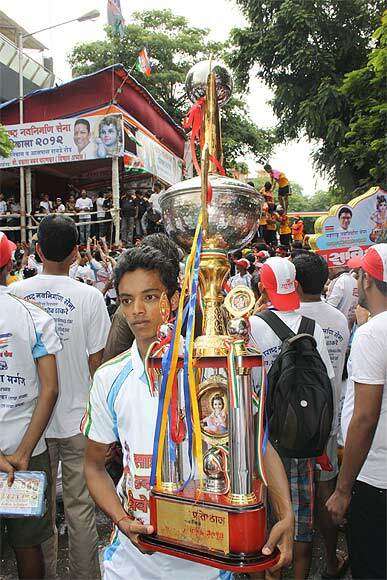 NCP minister Sachin Ahir's Sankalp Pratisthan-organised event at Worli also drew large crowds. Security was stepped to avoid any untoward incident. 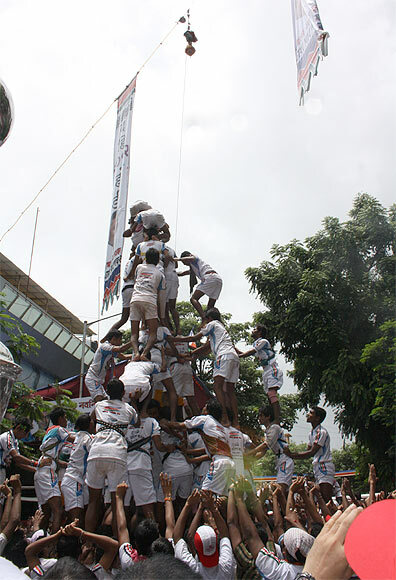 Police had instructed 'dahi handi' organisers to undertake mandatory safety and security precautions. 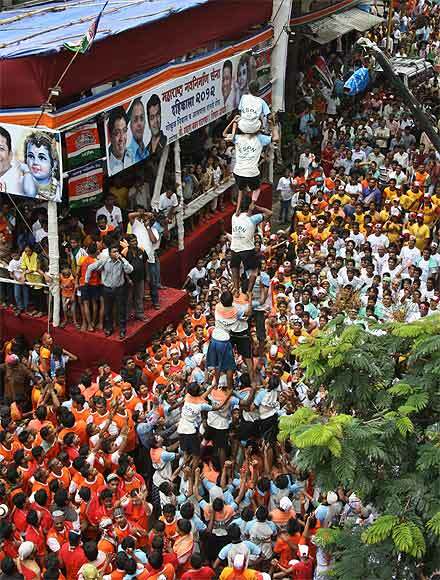 Youngsters in Dadar form a human pyramid to reach the dahi handi. 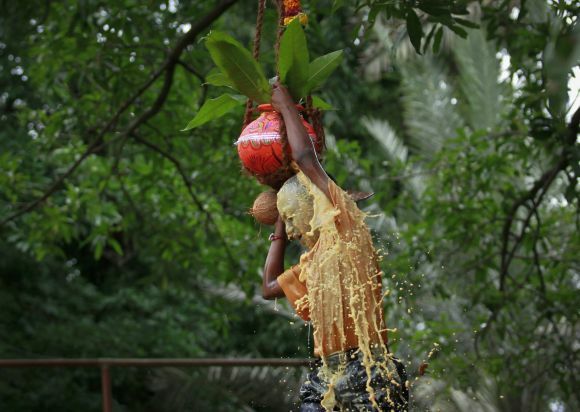 Dahi handi celebrates the mischievousness of the young Lord Krishna, whose favourite task was stealing the butter stored by his mother Yashoda and other women in Gokul. According to the police, CCTV cameras have been installed to keep a close watch on potential suspects to avoid any untoward incidents. Security has also been tightened at all the market places. By standers and govindas at the bottom of the human pyramid shout directions as the pyramid is built. 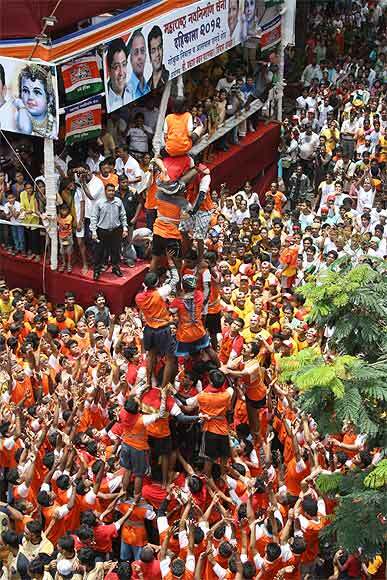 'Govindas' form human pyramids as they attempt to break clay pots filled with butter or curd. A student at a school for visually impaired youths breaks a clay pot containing curd during celebrations on the eve of Janmashtami in Mumbai. Don't Miss: The Radha-Krishna romance on the catwalk!